The swim and dive team smiles during a break in training at Florida International University. The team spent a total of eight days practicing in Miami, Florida. 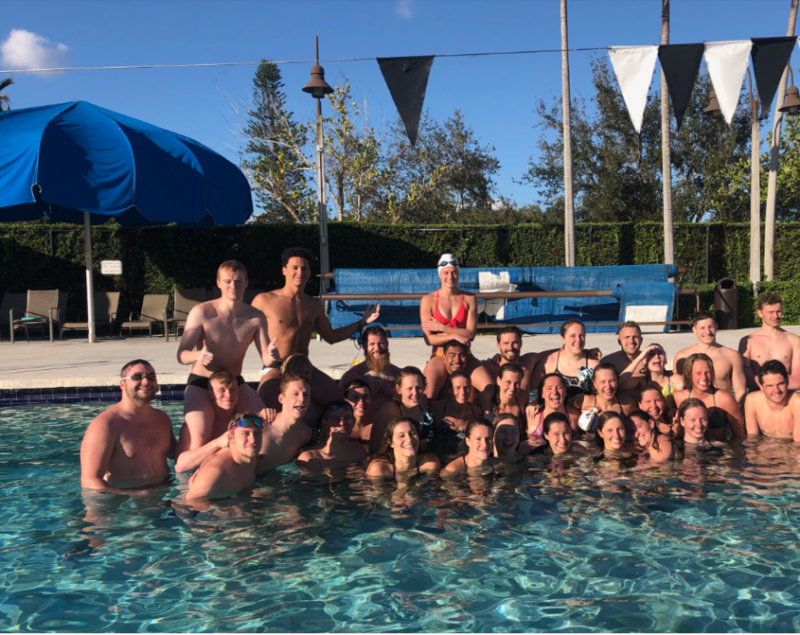 While most of the students at Allegheny College spent their winter breaks at home inside from the cold, the swimming and diving team was hard at work training in the Florida heat. Every winter break, the swimmers and divers head south on their annual training trip in someplace typically warmer than Meadville. This year, they spent eight days in the Miami suburbs. “We stayed in a Residence Inn about 15 minutes away from the pool, which was at Florida International University,” said Hunter Pietrzycki, ’21. The team attends training trips to both train and strengthen team bonds. 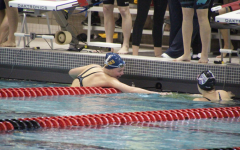 The coaches typically select places with warm weather in the winter so the team can swim outdoors, an advantage they cannot experience in January at Allegheny. Even though the trip is optional due to monetary costs, all members of the team typically attend, which allows for the teams’ bond to strengthen, according to the attendees of the trip. “We sacrifice a big piece of our Christmas break, so to help with that loss, it helps the team to be in a nice and sunny environment,” said head swim and dive coach Max Niggel. Training away from home and being in a different atmosphere has proven beneficial to the team, according to Pietrzycki. Pietrzycki pointed out the benefits of training away from home rather than training on campus during winter break. “It’s usually more positive because the place you train at home can sometimes be a negative headspace, because you just associate it with only practice, whereas if you go somewhere different it can be a little bit more positive on what you do,” Pietrzycki said. The eight-day training trip consisted of two hour practices in the mornings and afternoons each day, but the team often had afternoons off this season. Team members played video games, took trips to Muscle Beach and even went snorkeling and fishing at Biscayne National Park. “When we’re not in the pool, we have some time to look around the area and hang out at the beach,” said Rachel Montgomery, ’20. This was her third training trip for the swim team, previously attending trips in Fort Lauderdale, Florida and Phoenix, Arizona. The training pool in Florida is also bigger than the pool they use on campus. “We get to train in a long course pool, which is what you would see in the Olympics,” Niggel said. The diving well was significantly deeper than the one on campus, 15 and three quarters feet deep compared to the 14 feet deep pool on campus. “We train a little bit more when we’re down there because we don’t have the stress of classes and we can be training like professional swimmers,” Niggel said. 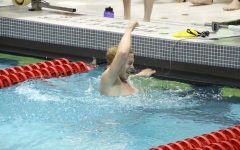 While some college teams attend training trips purely to train, the swim team prioritizes the bonding that occurs over the course of the trip. The team members and coaches agreed that it was a successful trip, both training-wise and bonding-wise. “It was a perfect balance of really hard training and a lot of fun,” Pietrzycki said.